I thought I had just about seen, or prayed, most of the beautiful accolades we give to Our Blessed Lady. But, life is full of surprises and, often it is said, that one can learn something new every day. Looking back over my life, I often refer to back the Litany of the Blessed Virgin Mary and the many lovely praises sung in that prayer: Mother of God, Mother of Christ, Mother most pure, Mother most chaste, Virgin most venerable, Virgin most renowned, Mirror of justice, Seat of wisdom, Mystical rose, Gate of Heaven … … the list of wonderful names goes on and on. That’s where I was – until last week – when the actions of a friend pointed my eyes in a new direction, to one I had never seen before – Our Lady, Undoer of Knots’. According to this more definitive authentication, devotions became known in the 18th century, originally for help in a difficult marriage. In the early 17th century, a noble couple were on the brink of divorce, and their priest prayed before Our Lady of Victory, holding up a ribbon (symbolic of the ribbon placed over the hands of a bridal couple) praying that all the ‘knots’ in the marriage might be untangled, and the marriage was saved. 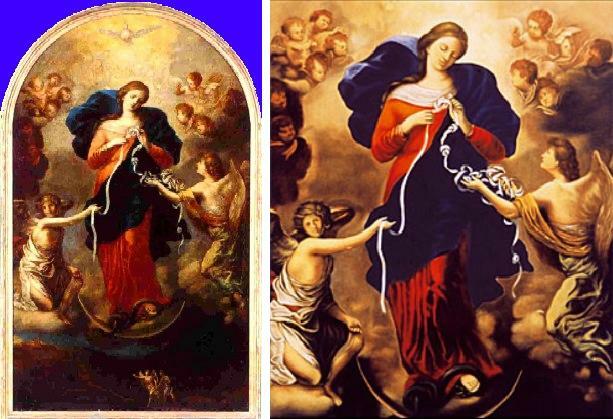 Some years later, Hieronymus Ambrosius Langenmantel (1666-1709), a priest relative of theirs, who lived in Augsburg, commissioned this painting, ‘Our Lady Undoer of Knots’, for a family altar. Of course, today’s common sense dictates that such devotion goes way beyond marital problems, and can be used in asking for help in any kind of crisis. 1st Knot: Our temptations – Please, Mary, Protect us. 2nd Knot: Our sins – Please, Mary, deliver us. 3rd Knot: our distresses – Please, Mary, succour us. 4th Knot: Our sorrows – Please, Mary, Comfort us. 5th Knot: Our fears – Please, Mary, Encourage us. 6th Knot: Our illnesses – Please, Mary, Alleviate us. 7th Knot: Our weaknesses – Please, Mary, Strengthen us. As Mary once said at a very famous apparition site, “In prayer you shall perceive the greatest joy — and the way out of every situation that has no exit.” Think of those words. Don’t you often find yourself in a situation that “has no exit”? How many times have you run into problems that seem to offer no positive outcome, got yourself into a corner, with no escape? The point is that when we invoke Mary’s help, she untangles our ‘knots’. In my view, I see all this to be a mysterious and quite beautiful image of Our Blessed Lady. Very often, we think of the ‘knots’ in our lives as present, troubling, situations, but they also may well be problems we have had for years, perhaps deep hurts between husband and wife, anger, resentment, sinful inclinations, the absence of peace and joy at home. A ‘knot’ can be a son addicted to drugs. It can be alcoholism. It can be guilt. It can be fear or depression or unemployment. It can be many things – and all of them trouble. 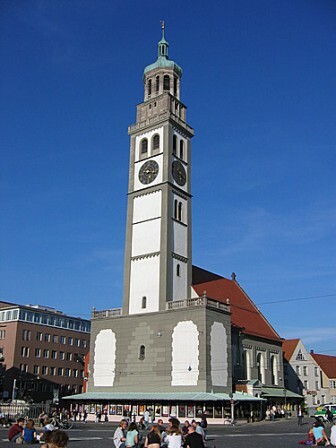 But, this, apparently, is where Mary Undoer (or ‘untier’) of Knots comes in. The point is that Mary comes to our aid in many, many different circumstances.